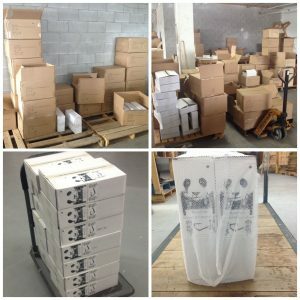 Loyal Bamboo Sheets Shop customers, just this morning, a new shipment containing bamboo sheets king size arrived from the factory and they arrived in less than 3 weeks! After an extremely busy late November/ early December 2013, we began running low on some product inventory, most noticeably 320 Thread Count bamboo sheets king size. Prior to the holidays, we decided to contact our factory and order more bamboo sheets king size and others in anticipation of increased sales after the holidays (for all the procrastinating shoppers). Guess what fans? It’s already paying dividends! We just received a new bamboo sheets shipment with dozens of boxes of bamboo sheets king size and other bamboo bedding. We will unload immediately! Once the shipment is unloaded and inspected by our team, we will begin shipping out the orders. Priority orders will go out today and I must say, tomorrow will be busy, there are so many orders to fill! Exciting! Lastly, you can count on all pending Bamboo Sheets Shop orders to be shipped out this week! Customers will receive all orders by next week, the latest. We hope you are all enjoying your new bamboo sheets and the rest of you will enjoy them soon enough. Keep us posted!